NACOS is often supported by generous donors who join with us to provide training and opportunity to Pastors and Lay Ministers serving Native American Communities. Your donations are helping support a growing and vibrant ministry of dedicated Native American Ministers and non-Native Americans interested in serving in these communities. For More information on how donations are used, please contact Fred Shaw, NACOS Director. Growing up on the Navajo Reservation in New Mexico in the 1950s was a conflicting and challenging time for Norman Mark. He came from a home that was steeped in tradition and only spoke the Navajo language. At age 5, he was taken from his family and placed in a Navajo boarding school. It was there that Norman said he first learned about religion. The Native American Course of Study also focuses on the healing of Native peoples from historical trauma such as boarding schools. At age 5, Norman Mark was taken from his family and placed in a Navajo boarding school. Photo courtesy of Fred Shaw. Between 1869 and the 1960s as many as 100,000 Native American children were removed from their homes, families and communities and taken to schools where they were punished for speaking their native languages and stripped of cultural practices and traditions, according to the National Native American Boarding School Healing Coalition. Mark said the boarding-school life left him with many problems growing up. He recalled not knowing what it was like to have the love and care of a mother. He also remembers being scared and alone. The problems led to him dropping out of high school in 10th grade. He chose to enlist during the Vietnam War and served for 12 years. Upon returning to the reservation in 1979, Mark found that a church had been built near his home. Despite his difficult past, he said he started attending church services again. That church eventually became the Four Corner Native American Ministry of Shiprock, New Mexico. It was there that he met the Rev. Calvin Hill, a Navajo minister who thought Mark would be a good candidate for ministry. “I went to Dallas to consider ministry, but it wasn’t for me,” Mark said. With Navajo as a first language and a limited understanding of English, Mark said writing essays for ministerial education was very difficult. That is when Hill sent him to the Native American Course of Study. Students of the Native American Course of Study meet twice a year in different regions of the U.S. In addition to the classroom work, they visit historic sites in the area and meet with Native communities. Photo courtesy of Fred Shaw. Details about the Native American Course of Study are available at www.umcnacos.org. The United Methodist Board of Higher Education and Ministry’s Division of Ordained Ministry oversees the Course of Study program, which supports people who feel led to become pastors but have no immediate plans to attend seminary. 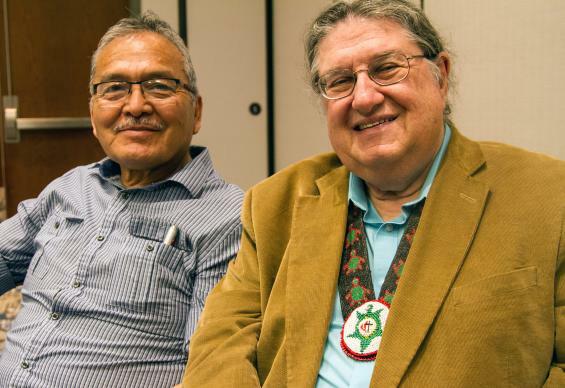 In 2003, the Native American Course of Study, based on existing certified programs, was expanded to include course work specifically for Native American pastors and persons who are working in a Native American context. The program requires 20 courses and takes five years to complete. Students meet twice a year in different regions of the U.S. In addition to the classroom work, they visit historic sites in the area and meet with Native communities. So far, more than 25 students have completed the course. “One of our goals is to train people who can begin churches,” Shaw said. Already, two students have started new churches. On the Spirit Lake Reservation in North Dakota, Mike Flowers, who will graduate from the Native American Course of Study in May, has had a ministry of presence on the reservation for 11 years. As a non-Native, Flowers and his wife, Libby, have provided meals, vacation Bible school and Lenten services and started a youth group for the community. It wasn’t until three years ago that the ministry grew into a congregation. Flowers said the congregation incorporates Native traditions in worship and often uses drums and Dakota hymns in prayer. Pastor Norman Mark with NACOS Director Fred Shaw. So far, more than 25 students have completed the Native Course of Study. The program requires 20 courses and takes five years to complete. Photo courtesy of Fred Shaw. The Native American Course of Study program also focuses on healing of Native peoples like Mark from historical trauma such as boarding schools. Mark successfully completed the Native American Course of Study program in October of 2017. He has since been appointed by the Rocky Mountain Conference as a local pastor to a new church start called Native Grace Intertribal Fellowship in Cortez, Colorado. He started the fellowship with three people attending and it has now grown to 47 members with a strong youth presence. 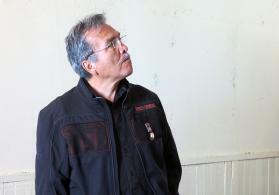 He said many of his members have struggled with similar issues stemming from the boarding-school era. Mark focuses on community outreach and spends considerable time going where Native people gather, such as powwows. He also launched a motorcycle ministry. Mark said his training helped him to increase his English skills and ground his understanding of the Bible. He said being encouraged to practice his Native traditions in ministry was life changing for him. Ginny Underwood is a freelance writer and communication consultant with ties to the Oklahoma Indian Missionary Conference. She is a member of the Comanche Nation of Oklahoma. News media contact: Vicki Brown at (615) 742-5470 or newsdesk@umcom.org. To read more United Methodist news, subscribe to the free Daily or Weekly Digests.